Halloween is just around the corner, and with pets playing such an important role in our families, it is only natural that we want to let them join in the fun. Here are a few ideas to help keep your pets safe this Halloween. 1. Be sure all pets are wearing collars with current ID tags. Identification tags are the fastest way to be reunited with your pet in the event of an unplanned escape. 2. If your dogs rush the door, consider keeping them contained in another part of the house during Trick or Treat time. This will help prevent escapes, avoid startling small Trick or Treat guests and make handing out candy much easier! This is particularly important with crafty felines, which can be masters of the sneaky departure! 3. If taking your dogs along Trick or Treating, it is helpful to place a reflective/lighted collar/leash to increase their visibility. Also, be sure your dog is comfortable with large crowds including many children, as this can be an overwhelming experience otherwise. If your dog is the shy type, this isn’t the night to desensitize them. Also, be aware that many dogs behave very differently to people in costume. 4. Keep all Halloween candy safely out of reach. Nothing will ruin a fun evening like a trip to the emergency clinic for chocolate intoxication! 5. Consider bringing your outside animals, particularly black cats, inside for the evening. While the majority of Halloween participants are innocently out for a fun night, it’s important to keep your pets protected from pranksters. Black cats are overly targeted this time of year for obvious reasons. 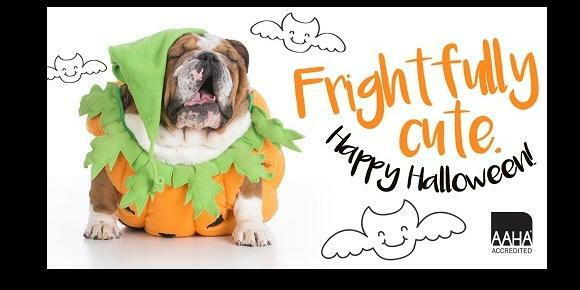 Enjoy your Halloween holiday and keep your pets safe!